What's up with those orange things? My pal naturalist Bill Amidon sent me some of his fabulous photos of nature. In one of the photos, there were some objects that I could not identify. He sent me this close-up of his upside-down tomato plants. 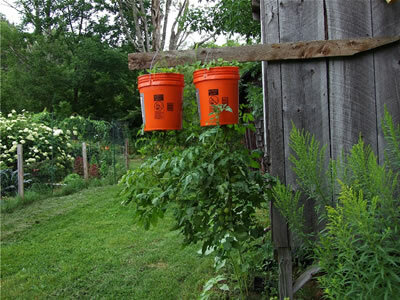 Wondering about the value of raising tomato plants upside-down, I did not bother to investigate too far. I decided to imagine for myself the justification of the trouble taken to do so. — If you get big tomatoes hanging free from the foliage and well off the ground, you can get a nice clean swing at them with a baseball bat. — You can harvest them with no lifting; you can just cut them off and let them fall into a tractor hopper. — If you forget to harvest them, they won't mush the plant when they fall off. — You can make Australian guests feel more at home. — You can make aging hippies stand on their heads. — The tomatoes won't mind being killed, because they've never had an uplifting moment in their lives anyway. — You can put one of your cattle skulls on the bucket and pretend it's a little orange bull with big red balls. — Somewhere there has to be a vegan cult that requires the ownership of hanging tomatoes for induction. — Carly Simon will have to rewrite "Anticipation." — When you get tomatoes to fall the wrong way, you can make self-tossed salad.